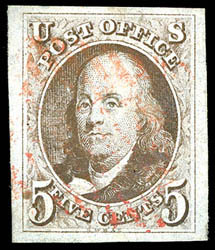 1847, 5¢ red brown, without gum, strong color and impression, large margins all around, Extremely Fine and attractive, a lovely mint stamp; with 2015 P.F. certificate. 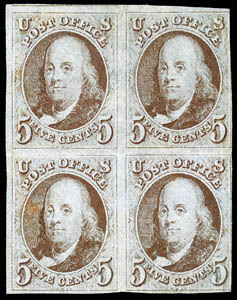 1847, 5¢ brown, block of 4, full o.g., margins large especially at top left showing portion of adjacent stamp at top, to just in at right, lovely late impression with bold brown color, horizontal crease along top frameline of bottom stamp, tiny scissor cut in margin between stamps at bottom and minor tone spots not mentioned in certificate, F.-V.F. appearance, the block could yield an outstanding, sound gem at the top left; with 2002 P.S.E. certificate. 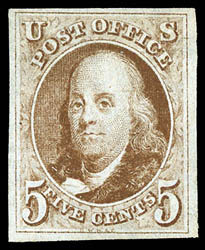 AN EXTREMELY RARE FULL ORIGINAL GUM BLOCK OF FOUR OF THE 1847 5¢ ISSUE. It is believed that fewer than twenty mint blocks of the 1847 5¢ issue exist today. 1847, 5¢ red brown, light red grid cancel, large even margins, strong color and crisp impression, Extremely Fine and choice, an outstanding gem; with 2015 P.F. certificate. 1847, 5¢ red brown, horizontal pair, four margins, tied by Alden N.Y. manuscript "X" cancels on 1848 buff cover to Liverpool, England, endorsed "Via Steamer from Boston", actually sent by private ship to Great Britain, reverse with "27 NO 1848, Liverpool, Ship" framed handstamp with matching "8" pence due rating handstamp ties pair, Very Fine and choice; with 1985 P.F. certificate. Scott No. 1 Estimate $2,000 - 3,000. 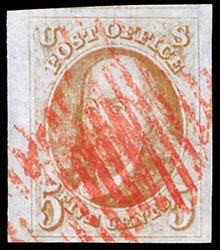 A RARE USE OF THE 1847 ISSUE ON MAIL CARRIED BY PRIVATE VESSEL DURING THE RETALIATORY RATE PERIOD, ONE OF ONLY SIX SUCH USES RECORDED. 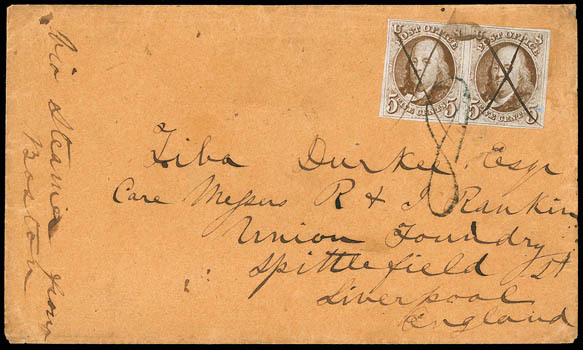 The 10¢ postage paid the over-300 miles rate from Alden N.Y. to port of departure. Since the Retaliatory Rate (24¢) was not paid, the post office presumably made the decision to place this letter on board a private vessel bound for Great Britain. The 8 pence due was the standard rate for the combined British ship letter fee and inland postage. This cover avoided the retaliatory packet charges as it had been carried by private ship. 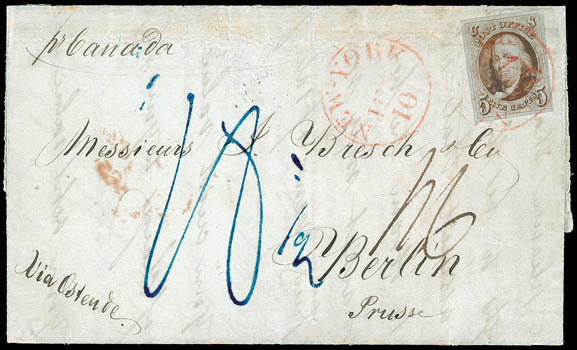 1847, 5¢ orange brown, large margins, bright shade, tied by partial strike of red "New-York Jul 10" cds, second strike adjacent, on 1851 bluish folded letter to Berlin, Prussia, endorsed "Via Ostende" at lower left, carried as endorsed by Cunard Line Canada from Boston Jun. 11th to Liverpool Jun. 21st, red London (6.22) backstamp with manuscript "1/6" 1s6d due rating, red Ostende (6.24) backstamp and blue manuscript "18½" silbergroschen due from addressee, Berlin (6.25) arrival backstamp; stamp lifted with two creases pressed and put back on cover which it originated, New York postmarks enhanced, Very Fine appearance; with 2000 P.F. certificate. Scott No. 1b Estimate $5,000 - 7,500. A RARE USE OF THE 1847 ISSUE TO BERLIN, PRUSSIA IN THE SCARCE ORANGE BROWN SHADE. Only two covers bearing the 1847 issue are recorded to Berlin, the other is an attempted demonetized use where most of the stamp was torn away. 1847, 5¢ red orange, left margin single, red grid cancels, full sheet margin with large to huge around showing portion of adjacent stamp at top, bright color and late impression associated with this rare shade, Extremely Fine and choice; with 2015 P.F. 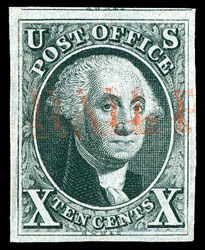 Graded certificate (XF 90, SSV $13,500). AN EXCEPTIONAL EXAMPLE OF THE 1847 5¢ RED ORANGE - THE RAREST OF ALL 1847 5¢ ISSUE SHADES. 1847, 10¢ black, red straight line "Philadelphia Railroad" cancel, large to huge margin showing portion of adjacent stamp at top, crisp detailed impression on bright paper, Extremely Fine and choice, a gorgeous stamp with this straightline railroad cancel; with 2014 P.F. 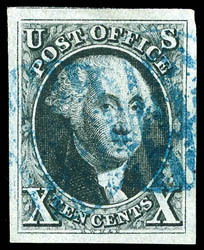 Graded certificate (XF 90 XQ, SSV $1,450 for 90). 1847, 10¢ black, blue circular grid cancels, large beautifully balanced margins all around, intense color and impression, Extremely Fine to Superb gem; with 2002 and 2015 P.F. certificates, latter Graded (XF-S 95 XQ, SSV $2,750 for 95). 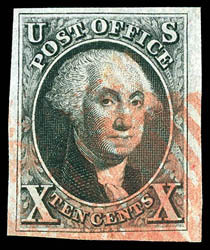 A SUPERB USED EXAMPLE OF THE 10¢ 1847 ISSUE. 1847, 10¢ black, red grid cancels, large to huge margins, rich color and sharp early impression, particularly fresh and Extremely Fine; with 2004 P.F. certificate. 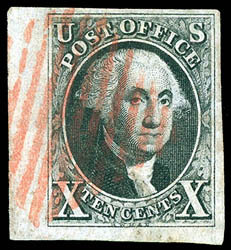 1847, 10¢ black, bottom left corner margin single (position 91R), neat complimentary red square grid cancel, wide corner sheet margin with large margins around, strong bold color and crisp detailed early impression, Extremely Fine and choice, a rare sound corner margin single; with 1999 and 2013 P.S.E. certificates.